“explores and addresses the relationship between the natural environment and the road system” (Forman et al., 2003, p.7). Road ecology was once referred to as the “sleeping giant in conservation ecology” by Forman & Alexander (1998), presently I would argue that the giant is in fact waking up. First, it is important to understand what road ecology is, and how it is defined. Roads are defined as “open way for the passage of vehicles” and ecology as the “study of interactions between organisms and the environment”. So, when one combines the two terms one gets “the interaction of organisms and the environment linked to roads and vehicles” (Forman et al., 2003). Forman (2003) has suggested “thus, road ecology explores and addresses the relationship between the natural environment and the road system”. These definitions come from Forman’s book “Road Ecology: science and solutions” that combines the ideas of all the leading researchers in the field of road ecology and could be considered an authority on the subject (Forman et al., 2003 pg. 7). So, what have researchers and scholars learned from “road ecology” as it relates to habitat fragmentation? In the United States, there are 3.9 million miles of roads that have caused general fragmentation and increased the “road barrier effect”; resulting in over 71 million acres of disconnected habitat, nationwide (Forman et al., 2003). In the Pacific Northwest (PNW) the state of Washington boasts 80,000 miles of public roads, with over 7,000 miles of state highway, but this total of 87,000 miles does not include forest roads, deeply rural roads, or privately maintained roads (WSDOT 2016). Studies have shown, that for every mile-long 16-foot-wide section of road, two acres of natural habitat are destroyed (Forman et al., 2003). With some simple math we can estimate how much habitat has been destroyed in Washington due to roads: a conservative estimate of 174,000 acres, assuming all roads are only 16 feet wide; however, some roads are much wider. The question then becomes, why is habitat fragmentation even important? A quote from Wilcox (1985) begins to provide the answer “Habitat fragmentation is the most serious threat to biological diversity, and the primary cause of the present extinction event” (Wilcox & Murphy, 1985). The last three decades has seen a growth in research related to habitat fragmentation/connectivity and structure permeability, helping to explain the significant and usually negative effects roads have on ecosystems and wildlife (Forman et al., 2003; Forman & Alexander, 1998; Spellerberg, 1998). For example, roads and road barriers increase animal avoidance, flora/fauna extirpation, flora/fauna extinction, wildlife mortality, vehicle-wildlife-collisions, invasive species, human injuries/death, financial costs, pollution, flooding, and dirty run-offs. In contrast, there is decreases in genetic migration, biodiversity, local populations, habitat, fecundity, and wildlife mobility (Alexander & Waters, 2000; Clevenger, 2012; Forman et al., 2003; Spellerberg 1998; Wilcove, Rothstein, Dubow, Phillips, & Losos, 1998). Spellerberg (1998) offers an exhaustive review of empirical research papers and has created a table to visualize the many effects of roads on ecosystems and wildlife (see Table 1.) (pg. 318). It is true that not all species experience the negative effects of roads, some species thrive, particularly invasive species; however, for most species roadways and the loss of habitat associated with them increase environmental pressure and stress (Coffin, 2006; Spellerberg, 1998). There is a direct loss of habitat and biota. There are effects resulting from the infrastructure and supporting activities for construction. The impacts may occur beyond the immediate vicinity of the road: for example, changes in the hydrology. Mining for aggregates for the road may take place in a different area. It is important therefore to agree on the geographical boundary for an impact assessment. The near linear surface creates a new micro-climate and a change in other physical conditions extends varying distances from the road edge. The newly created edge provides habitat for edge species. Plant mortalities increases along the edge: and such mortalities may extend from the road edge for varying distances. The mortalities of plants have direct and secondary effects on other organisms. Some fauna move from the area of the road as a result of habitat loss and physical disturbance. Animals are killed by traffic. Long term effects Animals continue to be killed by traffic. The road kills have secondary effects as carrion. The loss of habitat and change in habitat extends beyond the edge of the road. The changes in the biological may extend for varying distances from the road edge. There is fragmentation of habitat and this in turn has implications for habitat damage and loss. for dispersal and vagility of organisms. and for sola at ion of populations. The edge habitat (or ecotone) and traffic on the road may facilitate dispersal for some taxa. including pest species. The dispersal of pest species via ecotones or traffic may have secondary effects on biological continuities. Associated structures such as bridges and tunnels may provide habitats for some taxa. The run-off from the roads affects aquatic communities. Table 1. A comprehensive overview of the effects of roads on ecosystems. Divided up into temporal categories. This table was directly adapted from Spellerberg 1998. Although climate change adaptation is not included it is still a complete overview of the effects of roads on ecosystems. Wildlife-vehicle collisions cause injury and death for both humans and wildlife. In the United States alone, there are 29,000 human injuries, as well as an average of 211 human deaths. In Washington State, 2 people die each year and 1190 injuries are reported from these collisions. (Forman et al., 2003; Washington State Transportation Department [WSDOT], 2018). As dangerous as roads are for humans, they are far more dangerous to wildlife. For example, nationally there are 720,000 collisions a year in the U.S with deer, not including other species. And in Washington State, WSDOT reports removing roughly 3500 carcasses each year from road sides; which far exceeds the reported number of incidents, only 1100 are reported (WSDOT 2018). There are also monetary costs related to these incidents as well, leading to a nationwide expense of roughly 1.1 billion dollars (Foreman et al. 2003). Human and animal safety are important factors when considering how to better mitigate fragmentation caused by roadways. There is a growing body of knowledge on the need for connectivity of habitat to maintain biodiversity through a changing climate. Heller& Zavaleta (2009) reviewed 22 years of science consisting of 524 recommendations from 113 peer reviewed articles, from that analysis 5 reoccurring recommendations are discovered. Interestingly, the top recommendation is to increase connectivity, and reducing fragmentation is the third most frequent recommendation. Therefore, with climate changing the discipline of “road ecology” is more important than ever if humans desire the local flora and fauna to persist. By increasing habitat connectivity and limiting habitat fragmentation we can help to mitigate the effects of climate change on ecosystems and wildlife in the Pacific Northwest [PNW]. Lastly, climate change is moving much faster than early predictions, and far faster than any historical climate shift in the past (Krosby et al., 2010; Snover et al., 2013,). Historically, climate change has moved at a much slower rate than being observed today. The implication is that animals will therefore need to move faster, and possibly further than they did in the past to seek more favorable regions. If wildlife is to escape and adapt to the changing climate they will need access to not just historical migration routes, but possibly new ones; unfortunately, the current landscape of connectivity simply does not facilitate this need (Krosby et al., 2010; Snover et al., 2013). Roads, especially large interstates greatly restrict access to ancient migration routes, and fragment landscape from coast to coast, one way to limit their effect on wildlife in a changing climate to mitigate connectivity by making structures more permeable. One widely accepted mitigation technique is to construct wildlife bridges. Washington’s first attempt at a wildlife bridge was the Redmond ridge wildlife crossing, completed in 2014. It has already proven to be highly successful, with documented crossings of deer, bobcats, and coyotes. Although it can take up to 5 years for local wildlife to start using new crossing structures, this specific location is showing twice the activity for what the researchers expected at this early stage (Pak, 2015). 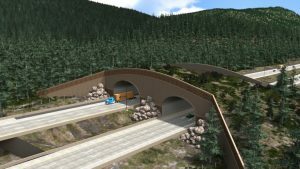 Washington is also looking to the future with ongoing wildlife bridge projects. 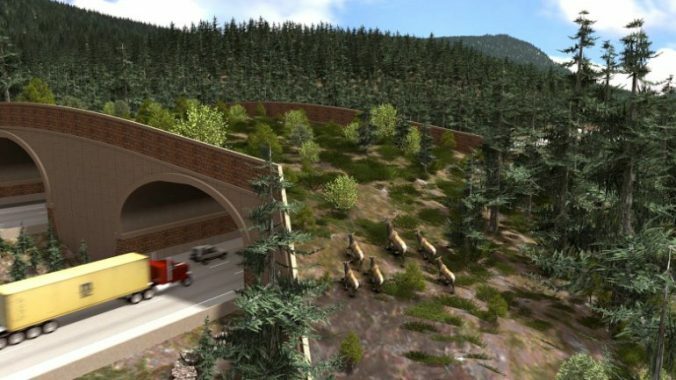 In fall of 2018, WSDOT estimates they will be completing the first wildlife bridge over I-90. The structure will be part of a 15-mile section of I-90 (see figure 1), that desperately needed upgrades and repairs, and has been rebuilt. The entire project will cost a billion dollars; however, the bridge itself is not that expensive, coming in at about 2.8 million dollars (Johnson, 2015). The funding had to come from many sources, in fact Washington State Fish and Wildlife [WDFW] paid 462,000, WSDOT paid 948,000, and the federal government added 1.28 million. The remaining funds came from non-profits who are local to the area, and Johnson (2015) reports that donations tended to be around 10,000 dollars. The reality is that without the support of conservation groups, hunting groups, and concerned citizens, the WSDOT would not have had the funds or public support for such an endeavor. Another widely accepted mitigation structure comes in the form of culverts (structures that cross under roads for drainage) and underpasses (areas underneath bridges). Culverts can mitigate fragmentation for terrestrial animals (e.g., raccoons, deer, elk etc..), but they are also key for mitigating fragmentation of aquatic habitats (e.g. salmon runs, estuary access), for key Washington species (i.e., salmon). Building new culverts and wildlife bridges can be extremely expensive and time consuming. The financial strain on state and federal agencies require approaches that can help to mitigate and limit the cost of building new infrastructure for connectivity. Two popular approaches are retrofitting existing structures, and adding enhancements (e.g., fencing) to existing structures (Glista et al., 2008; Huijser et al., 2016; Kintsch & Cramer 2011, McCollister & van Mann, 2009). In 1976, WSDOT re-purposed a defunct culvert into a makeshift wildlife underpass, its original intention was to make sure game species could still migrate into popular hunting areas. A study the existing structure examined its effectiveness as a retrofitted wildlife passageway (Kintsch & Cramer, 2011). During the six-month long study, a black bear (Ursus americanus), a mule deer (Odocoileus heminous), and a doe were photographed using the culvert; in addition, numerous deer and elk tracks were seen and verified by researchers (Kintsch & Cramer, 2011). This suggests that retrofitted or enhanced culverts/underpasses can be a potential mitigating strategy when looking for ways to reduce fragmentation by roads. Where in Washington State should mitigation be implemented? The “sleeping giant of conservation ecology”, has been stirring for some time, but I believe it is finally awake. Road ecology has become a strong interdisciplinary way of thinking, and what it has revealed about habitat fragmentation caused by roads is invaluable. The current state of GIS mapping technology gives engineers and biologists opportunities to create permeable landscapes for wildlife as we go into the future. There are numerous negative effects related to fragmentation caused by roads, including the inability for some species to respond to climate change. There are also effective mitigation measures than can be put into place to greatly reduce the damage to ecosystems; and reduce the extinction or extirpation rates of local species. Now that the giant is awake it is time to quickly act, to move forward with more connectivity research and projects. More importantly we need to better design new infrastructure (e.g. roads, highways) to not conflict with the environment around it, but to enhance it, not just for motor vehicles, but for humans, wildlife, and the local ecosystems in which they exist. Check out https://www.waconnected.org for detailed GIS maps, educational tools, scientific analysis, and general information. Brian C. Stewart, The Evergreen State College 2018. Forman T.T R., Sperling D., Bissonette A. J., Clevenger P.A., Cutshall D.C., Dale H. V., Fahrig L., France R.,… & Winter C.T., (2003). Road Ecology Science and Solutions. Island press. Kintsch J., & Cramer P.C., (2011). Permeability of existing structures for terrestrial wildlife: A passage assessment system. Report No. WA-RD 777.1. Washington state department of transportation. Olympia Washington..
Seasonalight – The route to the end of the road.